ISSUE 40.2 IS STILL AVAILABLE! Our Fall/Winter Issue (40.2) is still available. This issue includes work from National Book Award winner, Daniel Borzutzky, as well as work from Timothy Yu, Jenny Johnson, Liz Prato, Weisheng Renee Mao, John Cayley and more! 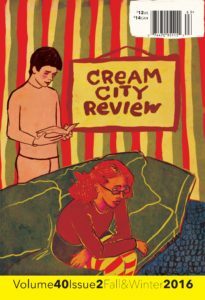 To purchase, go to: https://uwm.edu/creamcityreview/buy/.